Horizontal scope – the set of products and services offered – is an important dimension of firm strategy and a potentially significant source of competitive advantage. 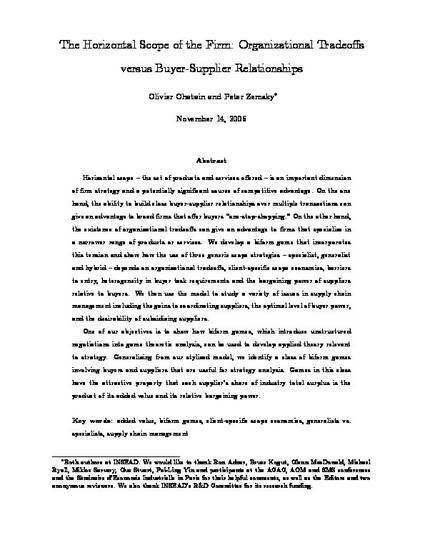 On the one hand, the ability to build close buyer-supplier relationships over multiple transactions can give an advantage to broad firms that offer buyers “one-stop-shopping.” On the other hand, the existence of organizational tradeoffs can give an advantage to firms that specialize in a narrower range of products or services. We develop a biform game that incorporates this tension and show how the use of three generic scope strategies – specialist, generalist and hybrid – depends on organizational tradeoffs, client-specific scope economies, barriers to entry, heterogeneity in buyer task requirements and the bargaining power of suppliers relative to buyers. We then use the model to study a variety of issues in supply chain management including the gains to coordinating suppliers, the optimal level of buyer power, and the desirability of subsidizing suppliers. One of our objectives is to show how biform games, which introduce unstructured negotiations into game theoretic analysis, can be used to develop applied theory relevant to strategy. Generalizing from our stylized model, we identify a class of biform games involving buyers and suppliers that are useful for strategy analysis. Games in this class have the attractive property that each supplier’s share of industry total surplus is the product of its added value and its relative bargaining power.